MILWAUKEE – (July 11, 2018) – Johnson Controls announce the release of the Cheetah SE High Assurance Smart Card Reader from Innometriks, providing end users with an economically priced, compact, high assurance reader for installations requiring two-factor authentication to meet federal credentialing requirements. 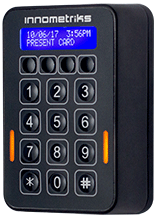 With a wide range of communication options, Cheetah SE readers can seamlessly integrate into various existing physical access control systems for authentication and network environments for administration. The easy to deploy, flexible Cheetah SE High Assurance Smart Card Reader provides tiered authentication levels designed to enable the incremental rollout of PIV-enabled access points. With its ability to read FIPS-201 based credentials (PIV, PIV-I, CIV, CAC, TWIC), the readers empower agencies to realize the full potential of government-issued credentials. Using a secure browser connection, end users can manage enterprise installations and network-based firmware upgrades from a central location, allowing for easy set up and deployment on large systems through the use of configuration files. From one location, end users can ensure the correct settings are in place on each reader, while remotely managing licenses. The Cheetah SE comes with support for Software House RM Reader functionality, allowing end users to easily and remotely activate cameras, doors and other events. This intuitive system can also trigger a duress call, and easily arm and disarm alarm monitoring points in a defined area or an entire facility within the C•CURE 9000 security and event management system from Software House. For more information on Innometriks Cheetah SE High Assurance Smart Reader, visit www.swhouse.com. Johnson Controls Building Technologies & Solutions is making the world safer, smarter and more sustainable – one building at a time. Our technology portfolio integrates every aspect of a building – whether security systems, energy management, fire protection or HVACR – to ensure that we exceed customer expectations at all times. We operate in more than 150 countries through our unmatched network of branches and distribution channels, helping building owners, operators, engineers and contractors enhance the full lifecycle of any facility. Our arsenal of brands includes some of the most trusted names in the industry, such as Tyco&reg;, YORK&reg;, Metasys&reg;, Ruskin&reg;, Titus&reg;, Frick&reg;, PENN&reg;, Sabroe&reg;, Simplex&reg; and Grinnell&reg;. For more information, visit www.johnsoncontrols.com or follow @JCI_Buildings on Twitter.